Israel is heading towards a profound internal crisis: a Jew-on-Jew confrontation, which has major implications for its relations with the Palestinians, as well as its Arab neighbors. The conflict is between the highly militarized Zionist state and the Haredi religious movement over a number of issues, including recent proposals by the Israeli Prime Minister Netanyahu to end the religious exemption of Haredi youth from serving in Israel’s colonial armed forces. Even before the forcible imposition (‘founding’) of the state of Israel, the Haredim were opposed to Zionism. Today the vast majority of Haredim in Israel remain staunchly opposed to the Zionist state for religious, ethical, and political reasons. Haredi religious teaching claims that the Jewish people are bound by three oaths: (1) not to settle in Israel by using force or violence, (2) not to make war with other nations, and (3) not to act as if the other nations of the world would persecute Israel. Haredim opposed Israel’s violent ethnic cleaning of over 850,000 Palestinians in the course of establishing the Israeli State and continues to oppose Israeli settlers’ violently land grabs against Palestinians. Unlike other so-called ‘ultra-Orthodox’ sects, who support Zionist colonialism and bless the Israeli military, the Haredim maintain that militarism corrupts the spirit and that Zionists have transformed Jews from righteous followers of the Torah into rabid ethnocentric supporters of a militarist state. For the Haredim, ‘state worship’, especially the waving of the Israeli flag in the temple, is a sacrilege comparable to the renegade Jews condemned by Moses for worshipping the Golden Calf. The majority of Haredim boycott elections, organize their own schools (Yeshivas), encourage students to deepen their religious studies, emphasize community and family values (of a profoundly patriarchal sort) with numerous children and strongly reject the Zionist state’s efforts to conscript Haredi youth into their colonial occupation army, the so-called Israeli Defense (sic) Force (IDF). All major Zionist political parties and the ruling colonial regime unite to demonize the Haredim, claiming they are shirking their patriotic military responsibilities. Via the mass media and public pronouncements Zionist politicians and the state incite Israeli hatred against the Haredim: A study in 2006 claimed that over a third of Israeli Jews identified the Haredim as the most unpopular group in Israel. The Haredim, on the other hand, have reason to fear and loath the secular militarist Zionist state and politicians: They claim that after World War II in the Zionist-controlled relocation camps for refugee Jewish children in Teheran, the Jewish Agency imposed Zionist ideology and militarist anti-religious policies in order to cut Haredim children off from their spiritual roots. According to one Haredim report many religious Jewish youth from Poland, mostly survivors of the Holocaust and Soviet Russia, were subjected to “unimaginable mental and physical cruelty with one goal in mind: (the) obliteration of Judaism.” Given the Israeli drive today to harness a corrupted form of Judaism to serve colonial militarism, the Haredim have every reason to believe that the conscription of their sons and daughters will be accompanied by cruel, systematic Zionist brainwashing to ensure they make efficient (brutal) occupation soldiers. Some Haredim leaders have met with Palestinian and Iranian officials and, in line with their religious doctrine, have declared their support for peaceful resolution of conflicts and denounced Israel’s aggressive military posture. Haredim are intensely religious and dedicate their time to discuss and debate the readings of their great religious scholars: Their message to the Zionists is to read Maimonides’ ethical treatises rather than listen to Netanyahu’s bellicose, blood curdling rants. 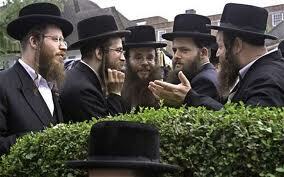 Haredim live and study largely within the confines of their closed communities. They insist on sending their sons to the yeshivas to study religious doctrine rather than to the West Bank to kill Palestinians. They call on their children to serve G-d — not the IDF. They seek truth in the Torah — not in conquest via the Preventive War Doctrines espoused by prestigious Israeli and overseas Zionist academic militarists. Haredim focus on building a better life within their community; they reject the efforts of the Zionist state to entice them into joining the violent self-styled ‘Jewish’ settlers engaged in brutal land grabs in the West Bank, in the name of “contributing to society (sic)”. The ‘introverted Haredi way of life’ is seen as a righteous alternative to the crass militarism, money laundering, financial speculation, human body part trafficking and real estate swindles rife among the elite Israelis and among sectors of overseas Zionists engaged in procuring multi- billion dollar tribute from the US Treasury. The Haredim demand that the Israeli Jewish elite stop trying to conscript their youth into the IDF and stop the job discrimination, which has tripled the unemployment rate among Haredim. The elected leader, Yair Lapid, of newly formed Yesh Atid Party, dubbed a “centrist” by the New York Times, and a ‘moderate’ by the leading ideologues of the US Zionist “lobby,” ran on a platform of forcibly ending the Haredi exemption from conscription into the colonial military service. Yair Lapid, in the run-up to joining a new Netanyahu coalition regime, has launched a vicious attack on the Haredim. Lapid premises his agreement to joining Netanyahu’s war machine on his plans to forcibly confront the Haredi leadership. Yair Lapid taps the class and secular resentments of Israel’s upwardly mobile youth who bitterly complain of having to serve in the army, thus delaying their money-making opportunities, while the poor, semi-literate “blacks” (a derogatory term referring to the clothing of Haredim) engage in “worthless studies” of the Torah. Lapid, using the same perverted logic as Netanyahu, claims that “Ten percent of the population cannot threaten 90 percent with civil war,” (Financial Times, 2/14/13, p. 6.). Once again, the executioner (Lapid) accuses the victim (Haredim) of the violence he is about to commit. Lapid’s Yesh Atid, the centrist (sic) party, has allied with Naftali Bennett’s neo-fascist ‘Jewish Home Party’ (pushing for the annexation of all of Palestine and expulsion of non-Jews) in smashing Haredi exemption to military conscription. They hold veto power over the next cabinet. This rabidly secular militarist assault has provoked great opposition and united the otherwise Zionist-religious parties: The Shas Party (Sephardic Haredim) and United Torah Judaism have taken up the defense of the Haredim. The Haredim hostility to the secular Zionist state is in part based on its opposition to military conscription, thus calling into question Israeli militarism, in general, and specifically its policy of colonial occupation and regional aggression. While some Haredim may oppose conscription for religious reasons and seek exemption solely for its own youth, objectively, the effect is to undermine Israel’s violation of Palestinian rights and to call into question the entire apartheid system. By speaking to spiritual values, they deny the legitimacy of the idea of a Jewish police state based on force, violence, torture and disappearance of political prisoners. Their questioning of the institutional configuration upholding Jewish supremacy and Israel as the homeland of the Chosen People, they strike a powerful blow at the ideological underpinnings of the overseas activity of the Zionist power configuration. Their animosity to the fusion of Jewish chauvinism and religious rituals and the tribal deification of the Israeli state is counterposed to their embrace of Moses Ten Commandments. The Haredim study the teaching of the profound Judaic philosopher Maimonides and abhor Zionist militaristic strategists like Walzer, Dershowitz, Kagan, Feith, Netanyahu, etc. who preach colonial “just war” doctrines. Representing 10% of the Israeli population and a far greater percentage of military age youth, the Haredim are in a position to sharply limit the scope of future Zionist wars. If they succeed in blocking conscription, they would provide a lasting contribution to making the world in general, and the Middle East in particular, a more secure and peaceful place to live. Facing the prospect of a loss of future cannon fodder to sustain its colonial ventures, and in their frenzied attacks on the Haredim, the Israeli-Zionist elite have incited the majority of Israeli Jews to demonize them as ‘backward,’ illiterate, freeloaders and to blame the religious curriculum for their growing and current 60% rate of poverty and high unemployment. Israel’s war machine needs fresh recruits to maintain its imperial quest for a Greater Israel. Demographics — with families exceeding five children — indicate the Haredim are likely to double their percentage of the Israeli population over the next two decades. Faced with the ‘facts on the ground and in the cradle,’ the colonial expansionist imperative drives all the leading Zionist parties to end Haredi exemptions. In response, Haredi leaders threaten to engage in massive civil disobedience if the Zionists impose conscription, rightly seeing conscription of its youth as an assault on its most profoundly held spiritual and family values and as an opening wedge in destroying traditional community solidarity and reciprocal relations. The Haredim share a common plight with Israel’s Arab population: Both communities face increasing police harassment, discrimination, religious persecution and rising levels of poverty. A Haredim-Arab alliance would unite 30% of the population against a common secular militarist and plutocratic enemy. Farfetched as it seems on the subjective level, there are objective historical and structural processes which are driving the two groups together.